iPad app midiSequencer has been given a major update, bringing a new look and a host of new capabilities. 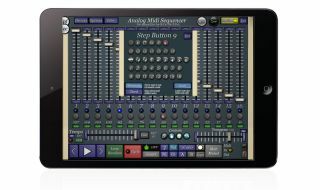 The app is built around a 16-step sequencer that can be used to drive coreMIDI compatible apps and hardware instruments via an iOS MIDI adapter of wireless network. One of midiSequencer's chief selling points is its ability to operate at a massively broad range of tempos, from 1bpm right up to 1020bpm. Top of the list of new features is the addition of up to 16 MIDI controls per step, which can each be set as CC, NRPN, RPN, program change, aftertouch, pitchbend or Sysex data. There's also a new per-step monitor function, increased bank size, the ability to limit control ranges, and a host of other tweaks and improvements. midiSequencer is available to buy from the App Store now, priced at £4.99/$6.99, where you can also check out the full list of features and improvements.